Looking through the new Office 365 beta and look what I found! 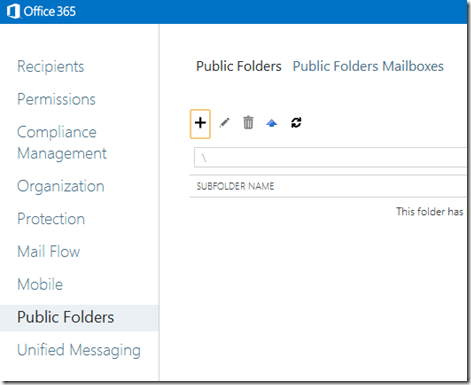 Public Folders seem to now be Office 365. Wow, not 100% sure how all this works yet but that should make Office 365 more enticing for businesses who have been big Public Folder users and have shied away from moving to Exchange Online. This book is designer for those that want to take Windows SharePoint Services v 3.0 beyond the basics. Implementing things like workflows and integrating with Microsoft Office allows you to unleash so much more of the power behind SharePoint. Every chapter in this book will give your techniques you can use with SharePoint to make it work better in your business. Apart from workflows you’ll learn how to create linking with Office products to create updating charts, the ability to take SharePoint information offline and more. Even though this book focuses on Windows SharePoint Services v3.0 the information is relevant for all versions of SharePoint and provides a quick way for readers to get up to speed with this powerful tool from Microsoft. If you want to make the most of Windows SharePoint Services then this book is for you. You’ll find this and all my other publications (free and commercial) at http://www.ciaops.com/downloads. Look out for new titles coming soon. 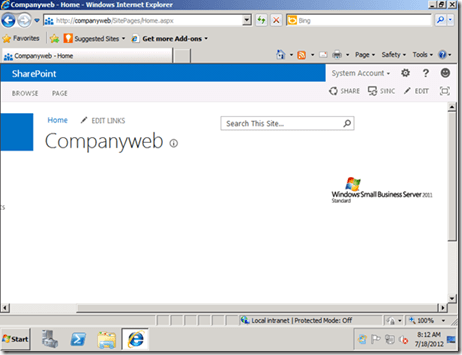 I am surprised that no one has sent me an email yet asking whether SharePoint 2013 Beta can upgrade the existing version of Companyweb on SBS 2011. So before you ask, yes it can. I wouldn’t recommend it just yet for a swag of reasons. However, as the screen shots below can testify, it can be done. – do all the SBS wizards still work? 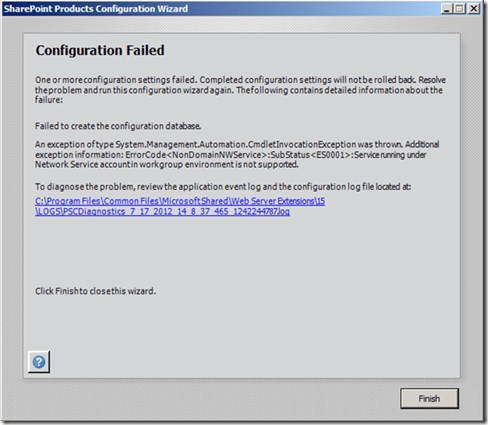 For the answers to these and many other questions you’ll probably have about SharePoint Foundation 2013 beta on SBS 2011 you’ll have to stay tuned to future posts. 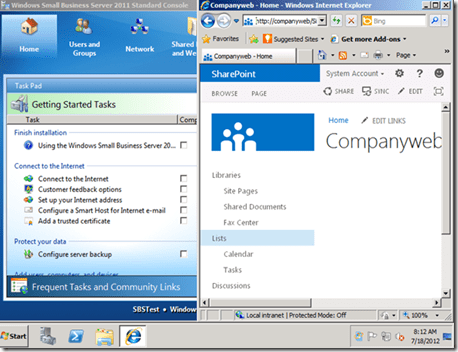 With new version of Office available this also means a new version of SharePoint and SharePoint Foundation. Given that everyone is probably banging on about everything else I thought I’d start taking a look at SharePoint Foundation 2013. My first attempt was to try and install it on a stand alone server box (i.e. workgroup) using the default options, which I have always done with previous versions. It kinda says “in a workgroup environment is not supported”. Interesting, seems like you need to have the server as part of a domain to actually install now. That’s different. I’m sure I can do it on a stand alone server via PowerShell but the first thing to note. No more default install onto a stand alone server. Please don’t forget the upcoming Desktop to Cloud User Group meeting next Wednesday from 6.15pm at 234 Miller St North Sydney (Stanton Library). Full directions available at http://www.desktoptocloud.com.au. – hear from ex Microsoftie Mark O’Shea about InTune and what transpired at Microsoft TechEd in the US. – have a look at the ‘must have’ apps for every device in our inaugural ‘App smack down challenge’. – look at the new Office 365 beta and Office 13 software. – if time permits, we’ll also have a discussion around the implications of SBS being discontinued and what options are available for on site server solutions. <img src="http://lh6.ggpht.com/-K35K3jnKx_I/UOOx5x3_VlI/AAAAAAAAGmo/B9aXaYsT16w/videod68556b291f6.jpg?imgmax=800" style="border-style: none" galleryimg="no" onload="var downlevelDiv = document.getElementById('2f6747fb-9752-4322-bc99-b6cb62c31dd1'); downlevelDiv.innerHTML = "
<img src="http://lh4.ggpht.com/-uzV8wGXYfUY/UOOx62AhkxI/AAAAAAAAGms/nDW5RRV_H9o/videoac5ea005e7d5.jpg?imgmax=800" style="border-style: none" galleryimg="no" onload="var downlevelDiv = document.getElementById('37cd0734-ece4-4a6e-9421-b0387eeeefc2'); downlevelDiv.innerHTML = "
Finally, it also means a new version of SharePoint, which I have downloaded and am playing with as I write this. I’ll have first impressions soon. Stay tuned. In this episode I’m joined by Ken Shafer and Jeff Middleton to discuss the recent changes to the Microsoft Small Business Server offerings. We chat about what the changes mean and what impact they will have on resellers and the community at large. We look at some ideas for what needs to happen in the SMB technology reseller space. If you sell or support Windows Small Business Server don’t miss this episode. I am always looking for guests to appear on the show so if you are interested please contact me directly (director@ciaops.com). This title is great for those starting using SharePoint Foundation 2010 on Small Business Server 2010 and is only $1.99 which I think is pretty good value for some training material. Stay tuned for a few more titles that will become available very shortly.